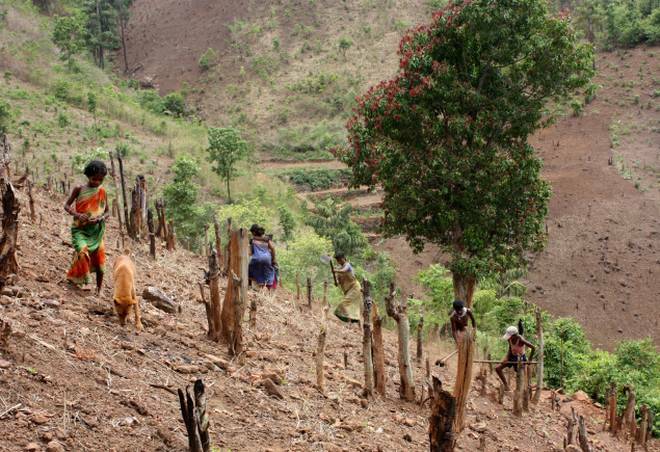 Despite the Forest Rights Act, tribals across the state are constantly threatened by forest officials for practicing podu or shifting cultivation. As Telangana gets set for the December 7 Assembly elections, Bandarugudem villagers in Dummugudem Mandal, Badradri Kothagudem district, are skeptical if the new government will provide them with pattas (land titles) to the podu lands they have been cultivating for generations. Podu cultivation is a form of shifting cultivation predominantly practiced by Adivasis on forest land. About 100 families live in Bandarugudem village, and all of them are Adivasis belonging to the Koya community. One of them, 50-year-old Kunja Seethamma is a small farmer owning three acres of land. However, she has land titles (evidence of ownership) for only two acres. “I’m waiting to get patta for my third acre which is a podu land,” Seethamma said. She said her husband died 20 years ago in an accident. “Since then I have been farming in these three acres of land and raised my two daughters,” she said, adding that she had filed a petition claiming the land title in the gram sabha held in her village in 2009, but the officials have not even looked into her claim. According to Section 4(3) of the Scheduled Tribes and other traditional forest dwellers (recognition of forest rights) Act, 2006, (FRA), the tribes are entitled to receive land titles up to 4 hectares, if the forest land is under their occupation and was being cultivated before December 13, 2005. Despite the law, instead of recognising forest rights, Adivasis are frequently being threatened for practicing podu cultivation across Dummugudem Mandal, said Ramana, former sarpanch of Bandarugudem village. “Nearly 5,000 Koyas in Dummugudem will be benefited if they are provided with land titles. While all the claims and land demarcations are clear, I don’t understand why the officials concerned are not doing their jobs,” Ramana told Newsclick. She said almsot all the Adivasis in Dummugudem, who are otherwise agricultural labourers, are claiming ownership of only one acre of land that they have been cultivating for generations. The issue of podu cultivation has become one of the main issues in the upcoming Assembly elections. As per data from Union Ministry of Tribal Affairs, at the end of February 2017, the Telangana government received 1,86, 534 claims for land titles from Adivasis hailing from communities such as Koyas, Chenchus, Thoti, Kolams among others. However, only 94,215 titles covering 7.5 lakh acre have been distributed. On the other side, an astonishing 80,890 claims (both individual and community claims) were rejected. Reportedly, Chief Minister K Chandrashekar Rao ordered forest department officials to not to accept further claims in January 2015. Various reports state that the transparent practices of investigating claims have not been adhered to, hence the high rate of rejection. Telangana has 26,904 sq. km of forest land which is 24% of the total geographical area of the state. Most of the forest areas are located in erstwhile districts of Khammam, Warangal, Adilabad and Mahabubnagar. There are about 31.78 lakh Scheduled Tribes people in the state, about 9% of the total population. According to a report, ‘Promise and Performance of Forest Rights Act, by NGO - Community Forest Rights Learning and Advocacy’, claims are often rejected at sub-divisional or district levels without hearing the claimant, in violation of the FRA Rules. Officials also often seek documentary evidence, rejecting other evidences admissible by the law. The report added that often the officials do not even communicate about rejection of claims to the claimants. Numerous cases are pending with the Hyderabad High Court on the illegal eviction of Adivasis from Podu lands. Reportedly, forest officials have threatened to evict Adivasis from 1,300 acres of land ‘occupation’ in Pinapaka and Chandrugonda Mandal in Badradi Kotagudem District. A few months before dissolving the Assembly, the TRS government had begun an investment support scheme - Rythu Bandhu – entailing distribution of Rs 4,000 per acre, per crop season. However, this scheme excluded farmers with podu lands. Of late, Adivasis, along with Left parties, have staged protests demanding extension of the scheme to podu cultivation. “The TRS government had never considered Podu cultivation as agriculture. We have led numerous protests demanding extension of the Rythu Bandhu scheme to podu cultivation, but it was not considered. Now, during election campaigning, Chief Minister KCR is raising the issue of podu land and extending Rythu Bandhu to it. People have not forgotten his dictatorial regime,” Kondal, Rythu Swarajya Vedika activist told Newsclick. Located in the newly-formed Badradri Kotagudem District, Badrachalam is an ST reserved constituency in the state. As per the Election Commission, there are 1,25,552 voters, of whom 61,449 are men, 64,091 women and 12 third gender persons. The constituency is spread across mandals -- Dummugudem, Wazeed, Venkatapuram and Cherla mandals along with Bhadrachalam (temple town). With about 51% ST voters, the issue of podu cultivation has become crucial here. The CPI(M)-led Bahujan Left Front’s is in electoral race to retain Badrachalam constituency. The party has fielded Mediyam Babu Rao this time. A former Lok Sabha MP from Badrachalam, Babu Rao said only Left parties could ensure protection of rights of the vulnerable sections of people. Babu Rao is pitted against TRS candidate Tellam Venkata Rao, Congress candidate Podam Veerayya and BJP candidate Kunja Satyavathi. People from Telangana are opposing the policies of PM Modi and the BJP.